The flag is square, white bordered banner of the state's arms, blue, white menorah (seven-armed candlestick), olive branches and the name of state beneath. The menorah on the emblem is a depiction of an engraving on Titus Arch in Rome of the menorah that stood in the second Jewish temple in Jerusalem. The menorah was looted by the Romans. Its fate is unknown. The presidential flag can seen frequently at official occasions. Since those are usually indoors, they put some kind of frame around it to keep it spread all the time. The flag is made of blue silk with silver strings that are woven on the silk to make the Menorah and the border. When it is hoisted side by side with the national flag, one can see the difference between the white [on the national flag] and silver [on the presidential standard]. I guess that outdoors they may use a plain printed flag, but the so-called official one is silver. Beside the known framed flag there is also an hoisted one. It doesn't look like 1:1 but as 8:11. A note in Album des Pavillons 2000 explains that the version for use at sea is with yellow border instead of white. I never saw a naval version of the presidential flag so I cannot tell how it looks like, however it seems odd that it would have a silver border and gold fringes, [so possibly the silver border is replaced by a gold one] and maybe the Menorah is gold too? At the National Photo Collection, I located photo of historical Presidential Standard hosited on the president car. It seems it was the state emblem on 1:1 white sqare. I guess the emblem was blue. 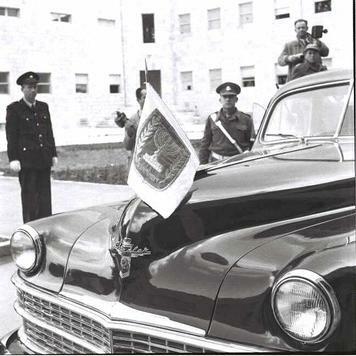 The photo caption is: "THE PRESIDENTIAL EMBLEM OF THE STATE OF ISRAEL, OUTSIDE THE JEWISH AGENCY BUILDING IN JERUSALEM, DURING INAUGURATION OF CHAIM WEIZMAN AS ISRAEL'S 1ST PRESIDENT." it was taken on 17 February 1949. Source: National Photo Collection, photo 7032. It seems that there was another version with state emblem insted of Magen David on vertical national flag (or maybe the above was only the car flag?) as seen in another photo from the National Photo Collection. "PRES. 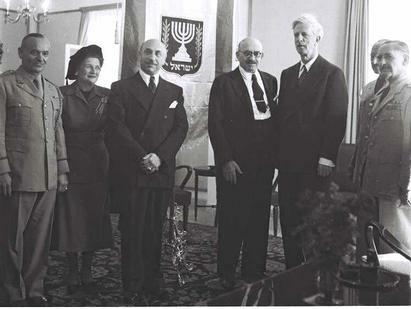 CHAIM WEIZMANN (CENTRE), WITH JAMES (R) MACDONALD & COMMANDER & MRS. GOLDBERG (L); THE BLUE AND WHITE FLAG WAS PRESENTED TO WEIZMANN BY AMERICAN JEWISH" it was taken on 26 October 1949. Source: National Photo Collection, photo 7038. Note that in a photo from 5 July 1950, you already can see the current presidential flag .